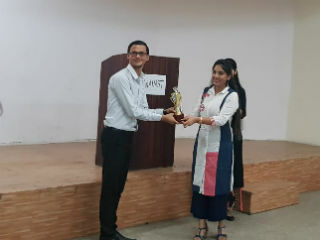 The event 'Battle it out' was organized by Literary Society, Expression on October 13, 2018 in Auditorium, Building A, for PGDM (2018-20) students.the judges were Deeksha Kapur and Diksha Luthra, both PGDM Second year students. The activity organizers received 15 registrations, with one withdrawal made at the last minute. All the 14 participants spoke for 60 seconds each in the preliminary round, i.e. extempore, on topics randomly assigned to them. These varied from "Sky is the Limit" to "Tom and Jerry." The best six speakers were the final round participants who debated on "India is ruled by the common man." 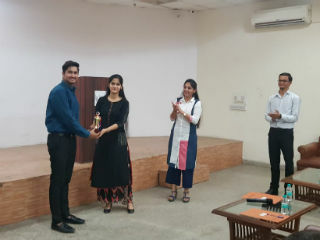 Some interesting discussions and comments from the judges ended the activity with the first prize being won by Pankaj, Section B, PGDM Year I and second prize by Shubham Sharma, Sec C, PGDM Year I. Chocolates were distributed to all the finalists as a token of encouragement.